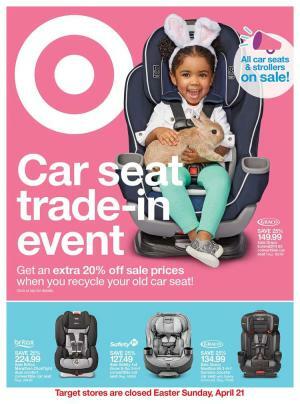 Target Weekly Ad Apr 21 – 27, 2019, the preview is available right now. Browse the ad, check out coupon match-ups, make your shopping list before you go to store. In this page, you’ll be able to browse Target Ad Preview. Usually, the deals are effective starting on Sunday. 10% off men’s tees. Valid 4/7-4/13. BOGO 50% off women’s jewelry & accessories. Valid 4/7-4/13. Free $40 gift card when you spend $250 on nursery furniture. Valid 4/7-4/13. Up to $150 off vacuums. Valid 4/7-4/13. BOGO 50% off games, puzzles & video games. Valid 4/7-4/13. What is Target Free Gift Cards? Remember to check in-store unadvertised deals as well. We try to share as soon as a new one comes up. Target provides special sales for Christmas, Thanksgiving, Black Friday and more. Be sure to check clearance after these days too. For example, Cyber Monday is a great sale to grab some deals on electronics such as gaming consoles. They are really extensive so that you will find a wide range of almost all video games, TV models and so on. Not to miss out any of Target Ad please subscribe to this category. Learn How To Do Coupon Matchups and save even more with Target. This week Target ad is fantastic! I'm gonna review products of Target ad fall style event. You can find BOGO (Buy one get one free) promotions on women's wear, men's wear, women shoes, bags and accessories! Wow it's a great chance to do fall outfit shopping. This fall, floral dresses are trendy like summer season. You can combine one button jackets and leather boots with that. Also leather shoulder bags are one of this fall season's trends. If you wanna be stylish, follow Walmart discounts and renew your wardrobe today! 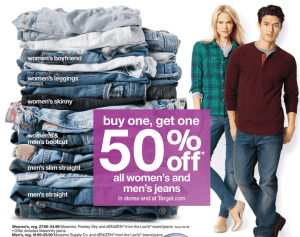 Let's take a look at offers of Target ad fall style event. Merona Apparel Brand 50% discount. Buy one get one free online or at stores. Womens Merona shirts and cardigans buy one get one free. All women's shoes 50% off. These are all 50% off. Buy one get one free. Don't miss the chance. All women's jewellery and accessories are 50% off. I love the handbag here. Also there are a lot of clutch and shoulder bag options. Take a look at Target ad for more. Men's Merona Apparel shirts, t-shirts and sweatshirts are 50% discount. Buy one get one free. Waering high quality underwear is very important for every woman. But high quality and fancy underwear is generally very expensive. You can take advantage of Target discount to get great underwear for low prices. Check the promotions. Gilligan & O’Malley unlined, lightly lined or push-up balconette bra $14 sale. Don't miss the huge discounts of Target ad fall style event. Stay stylish and trendy with Target! Target store weekly deals is on air. I'm gonna review especially new comers of weekend snacks. If you are working in an office 5 days a week, i'm sure you look forward to weekend coming. If you like to spend the weekends at home, doing some grocery shopping is a must. 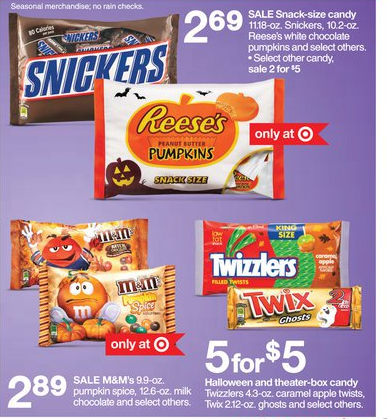 This week target store weekly deals are especially on snacks. Let's take a look at snacks on low prices. Breakfast is the most important meal of the day. If you want your metabolism to start, you shouldn't skip breakfast. Consuming some healthy carbs and proteins in the mornings will give you energy. This week there is a good sale on breakfast specials. Everybody needs to relax sometimes. How about rewarding yourself with some ice cream and chocolate at the weekend? Play your favourite movie and get some delicious snack. A movie without pop corn can't be thought. Target store weekly deals include pop corn savings this week. Hurry up and get your pop corn. Also children will have fun while it's popping. Getting different toys is a kid's number one wish. Finding low price toys is an issue most of the times. Also every parent wants his/her kid to play with educational toys. Target ad toys is here for you to find the suitable and high quality toys for your children with great prices. Also there is a superhero saving this week. 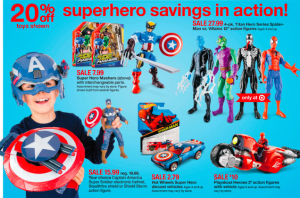 Let's take a closer look this week's Target ad toys offers. Terra Horse Barn ---- Wow this is on sale this week. It was for $79.00 last week and today you can purchase this product only for $60.00. Save 25%. This is sold both at stores and online. Mooshka Fairytales Doll Varieties ---- Choose form any Mooshka doll you wish. You can gift one of these to your loved ones also. For more Target ad toys you can visit your Target store or shop online! Today i'm gonna review Target weekly ad kitchen appliances section. As you know this ad will expire by September 13 and prices can change after that so hurry up to get your kitchen needs. Let's start with this weeks special offers. First of all there is a good promotion on Kitchenaid tool and gadget set. I love this set as it includes soup ladle, plane, scaler, garlic smasher, egg mixer, vegetable peeler and more. These are very handy items, i use all of them. My second favourite product is a cooking set. There are different sizes of pans and pots. The material is teflon so you won't have a sticking problem. I can't imagine a morning without coffee. And good coffee can be made with only good machine. This week there is a special offer if you buy Mr. coffee or magic bullet blender you will get $10 gift card. You can use this card on any other purchase you want or give away it. Finally i want to tell you about Dyson vacuum. This week is ta last chance to save on Dyson vacuum products. So hurry up not to miss the chance. For other products please explore the whole ad. 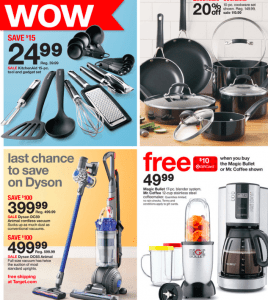 Target weekly ad kitchen appliances will always offer you the best price! This week's Target weekly ad grocery savings will make children and adults happy. There are delicious snack and food varieties, family favourites and good options for your children. If you have small kids, check out kids snack page. There are organic fruit snacks and they are really healthy. Don't always think about chips and chocolate when you hear the word snack. If you buy Suave Kids Wacky Melon 3-in-1 Wash for $4.99, you'll get one free. It's a good promotion. Don't miss it. How about buying drinks on large packs for super cheap prices? You can find 12 pack of soda and big enough tea options on family favourites part. Do you want to save more? In addition to Target weekly ad grocery savings, you can get extra 5% discount by using your red card. There is a good promotion on m&m candies. Buy 1, get 1 free. Target also pays attention to your pets. Check out Pedigree 46.8lb dry dog food PIPO $22.79 and get free shipping. Getting protein is important for your nutrition. Take a look at Target weekly ad grocery savings meat options and special offers. A good meat meal is with a good sauce obviously. Don't forget to check the last page to get the cheapest prices on cleaning and health products.